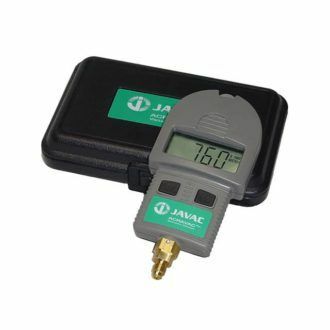 The JAVAC BluVac Digital Vacuum Gauge is a state-of-the-art digital vacuum gauge utilising patented technology to deliver the highest accuracy available.Operating for up to 300 hours on a single 9 volt battery, the BluVac sports a large 1/2″ numeric display and a bright blue back-light. The BluVac measures from 0—25,000 microns with 1 micron resolution. 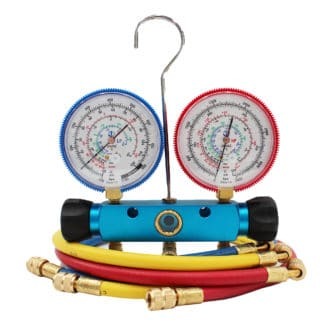 Possessing the very best accuracy and reliability, the BluVac gauge is ideal for budget conscious air conditioning and refrigeration technicians without sacrificing performance. Innovative Oil Sensor and Self-Diagnostics ensure accuracy. The BluVac is the only field calibratable vacuum gauges that require no special equipment for calibration. Best vacuum gauge on the planet if you use it properly. It can take some getting used to after using the others but once you figure it out then you will be glad that you bought it. Make the investment and get a quality vacuum gauge you can rely on for many years. Delivery is by courier from Auckland, delivery times may vary. All Auckland orders are delivered the next business day, other main business centres and standard areas are within two – three business days from payment. All rural areas are subject to normal rural delivery times. For more details on delivery please feel free to contact us before ordering. Please contact us for Return Authorisation before returning. If you are not completely satisfied with your purchase, simply contact us to return it within 30 days in the original packaging and condition supplied for a full refund. Unless specified all products carry a minimum 12-month manufacturer’s return to base warranty. HVACTOOLS will provide full support for this warranty. All products that are found to be faulty within 30 days of purchase will be replaced with brand new products.